Jon Jon Briones made his critically-acclaimed Broadway debut as The Engineer in the first-ever revival of Miss Saigon, running at the Broadway Theatre through January 14. Jon Jon previously played the Vietnamese pimp and survivor in productions around the world, including his Olivier-nominated performance in the London revival. Jon Jon’s history with the piece dates back to the original 1989 London production where he appeared in the ensemble. BroadwayBox caught up with Jon Jon to hear from him about how he crafted this dark, complex, and ultimately very human character. Definitely, my Engineer is much different than before. Creating The Engineer was a collaboration with me and my directors—and I’ve been directed by a few through the years. I rely so much on them because it’s the biggest role I’ve ever played. I tried a lot of physicality. I tried that John Travolta or Sylvester Stallone swagger walk. I’ve changed so many things through the years. The thing is, I’ve settled in a real swagger that the three-inch heels will give you. When I was younger, I moved a lot more and gesticulated a lot more. Now, it’s grounded and more deliberate which I think works better. [For this revival], it needs to come from a real place but at the same time we need to up the ante. It needs to be more dangerous than before. It can’t be any less than what we are seeing right now every day on TV and in social media. It needs to be in your face, real, and really dangerous. For example, the beginning scene (Dreamland) can’t be looking fun. The audience can’t think, ‘Wow, that’s so fun! I wish I was there!’ No, they need to see it and go, ‘Oh my God, I need to get out of here.’ It needs to be uncomfortable. Rehearsal is so important to me. It needs to be part of your being. It needs to be part of your muscles. Even when I’m so tired or sick, as soon as I step onstage and that light changes, and the sound of the helicopter comes on, and the Saigon street comes to life, I’m there. I just fly. When I started this, I started with: where does he come from and what is his childhood? Then I began drawing inspirations from my own childhood and experience. I think what really grounded me and my performance was my background. I grew up in a Third World country in a very, very poor neighborhood. I’d seen it. I’d seen people who struggled in life because of a lack of means. People who would do anything to get something. My neighborhood was in the middle of a squatters’ area so you see people trying to hustle every day. For me, it’s so important to understand the character and to like him. There must be something there that you can relate to, that you like, and that you understand so that you can tell his story. Not in a caricature way or a black and white way, but in a way that makes him real. My childhood made me understand that this guy grew up in this kind of situation which brought him to that point. It’s like having a wound that he keeps on aggravating. The pain and ugliness of it is his reality. He moves around carrying that. He doesn’t know anything better to try to get out of that. Then being around foreigners who invaded his country. We have that as well in the Philippines; there’s a huge American presence with a base and a Red Light District. I have hung out there a few times in the Red Light District and I’ve seen the pimps and the women trying to get by. I’ve seen it all first-hand so I understand the sense of wanting—of wanting what they have and the power they have. For The Engineer, it’s the envy of their status. He wanted that American dream. In the Philippines there’s even still that distorted American dream where people think money grows on trees in America. The Engineer needs to be bigger than life and better than anyone else. He needs to be better so that all these people come to his bar. Through the years, I’ve pushed the limit of this. It’s a work in progress. I am still trying to make him better and give a better performance of him. I still discover things about him. The one thing that’s going for him is that he talks to the audience. If I want to make that real, I feel he is talking to an imaginary friend to justify himself and his actions. People do this—you’ve done it; I’ve done it—where suddenly you’re in the street and you realize you’re talking to yourself. I feel like because he’s so self-absorbed, he thinks someone somewhere is watching him so he’s always on. I’ve noticed from performing this in different countries that different kinds of people react to the material differently. I’ve noticed the line ‘for men will always be men’ gets a different reaction in the Philippines and Hong Kong than in London. In Asia, they laugh about it. So, you adjust it and harness their reaction to develop the scene and make it better. The news and what’s going on around us informs me. The wars of the late ‘80s are different than the wars now, but it’s the same result: people are being separated from families and it creates hate and greed. But at the same time, war creates the most incredible stories of courage and love. As far as sustaining the run, I would attribute it to gratitude and love for what I do. I love what I do. It’s my first Broadway show and I’m just trying to make the most of it. One of my favorite movies is Field of Dreams and there’s that scene where Shoeless Joe Jackson talks about the game, and it’s the same as that. When I first understood that movie, I cried. It’s how I feel. Hearing the audience react to you, the smell of the theatre, the feel of the light on you, I’d do it for nothing. It is gratitude that I do this now. As an actor, I’ve had so many rejections and soul-searching moments. After a really bad audition in L.A., I was in my car and yelling at myself and yelling at God and asking him, ‘Do you want me to quit? I’ll quit for my family’s sake.’ But the day after, when I’ve calmed down, I said, ‘No, I can’t. I’d die if I didn’t do this.’ That made it clear to me that this is what I want to do, and that love sustains me during these years’ run. 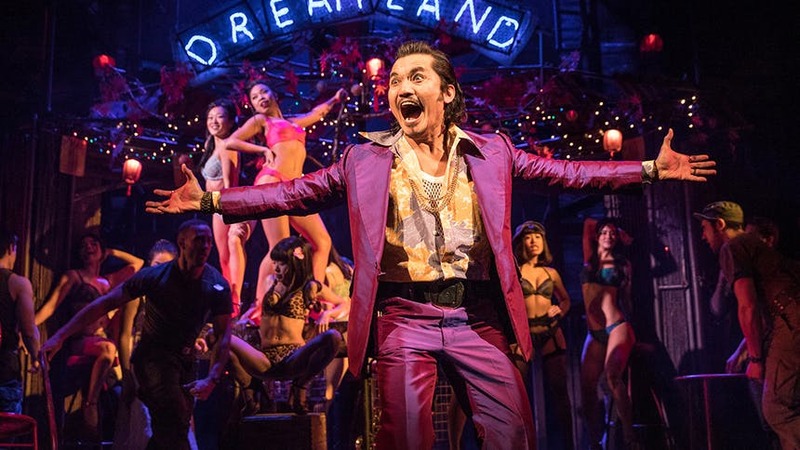 Don’t miss Jon Jon Briones in Miss Saigon at the Broadway Theatre through January 14.